I don't read the Goon propaganda site anymore, as most posts are unrelated to EVE and most of the remaining is just propaganda. But this post was sent to me and I've read it. It was a valuable read and gave a very good insight into the Goon mind. It holds the answer why Goons are being Goons: because mostly, they are right. The post is about a model moron and slacker who created a horribly fit officer Navy raven. After the inevitable gank, he gladly gave the worst possible answers to the reporter like "I have a job, I’m here to enjoy me, I have not much time, so I buy what I like, if you are envy, or other, it's not my problem." He clearly displayed that he learned nothing from his misfortune. Instead, he thrown another $1400 to the game to re-buy his ship, which was scammed out by Goons. Would I have scammed him? No. Like every decent person, I would take the time to explain him why is he wrong. And by doing so, I'd miss out on 60B loot and he wouldn't be an inch smarter. He was a M&S beyond help. The Goons did the best possible thing: salvaged 60B worth of items from this brainless creature. Again: in this situation I'd act dumbly and Goons acted perfectly. 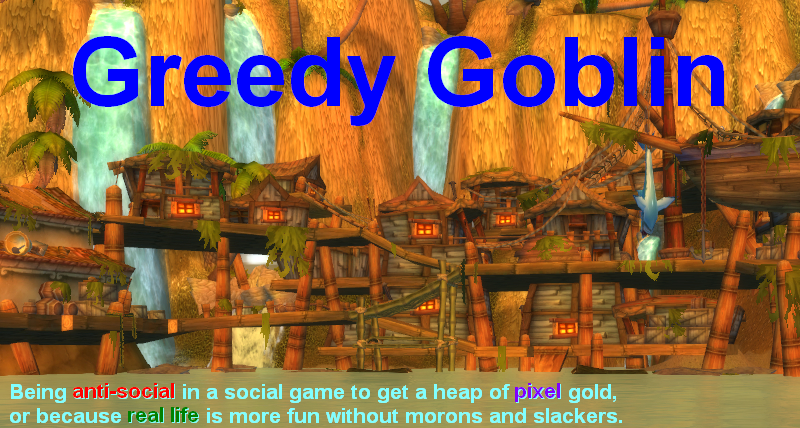 I've started blogging when I realized WoW has serious M&S infestation. I made my audience by preaching "stop being helpful with morons and slackers". I've left WoW when Blizzard made it clear that absolutely everyone (including literal AFK) is entitled for progression and rewards. Yet it seems I still have too much faith in humanity. This post made clear why Goons can be successful, despite being horrible and obnoxious: because in most cases - just like this - they are right. This person is beyond help. Any intelligent word, any attempt to enlighten him is a waste of time and the opportunity of exploiting him. This ALOD explains why Goons see the World as they do: everyone outside of themselves is an idiot who deserves nothing but scamming, ganking, tear-harvesting. Because in 95% of the cases, they are right. Which also means that I'm wrong in 95% of the cases when I try to teach and explain. Goons aren't demons from Hell nor playing from the prison where they are locked for childraping. They merely given up hope that they can find intelligent people outside of their circles. They believe that the pubbies (meaning: outsiders, strangers) are all morons and slackers who can't be reasoned with, the best course of action is robbing or enslaving them. Being a Goon sometimes must feel awesome, but usually it is terrible. Being sure to belong a small elite of intelligent people among seas of morons must feel great. But being sure that you are surrounded by legions of hungry, mindless creatures who can't be reasoned with must be terrible. Luckily it's not the case. I mean most of them are indeed morons and slackers, but not all of them. There is a significant minority that is intelligent and hard-working, and also there is a larger minority who isn't beyond help. I dedicated all my blogging to empower the first, fixing the second and fighting the ones who really can't be saved. Knowing that I'm not alone in a zombie-besieged mall feels much better. So it is up to us to bring back hope to the heart of Goons. To prove them that not all pubbies (non-Goons) are mindless zombies. There is only one way to do it: defeat them. Only then they will believe that we are equals. Join the Lemmings or send financial support! The Goons need us! PS: Goon pets have trouble understanding that highsec doesn't like them. Daily business tip: if you do BPO research in lowsec or NPC null, have black ops battleship for transportation. Taking gates with several billions worth of BPOs isn't fun even when the constellation is quiet. Hint: the constellation is not considered quiet if Brave Collective decides to deploy there. You know, if EVE could band together around one thing, goons and all this horrors and such aside, I'd like to suggest our first scapegoat; WoW. Having played a free trial and having friends who either played it for years, still do, or nearly lost their rational life to it, I'd take EVE any day. At least we aren't loosing our rational lives to killing odd floating magical worms and know the definition of risk and, thanks to that definition, the definition of reward. Otherwise, when it comes to TMC, of course it has a Goon leaning, that's why I read other websites, but my experience and business sense tells me The_Mittani is too smart to be overtly goon leaning, that is his income source we're talking about. This ALOD explains why Goons see the World as they do: everyone outside of themselves is an idiot who deserves nothing but scamming, ganking, tear-harvesting. Because in 95% of the cases, they are right. Which also means that I'm wrong in 95% of the cases when I try to teach and explain. Actually, they see everyone as idiots. Quite a lot of us do. The difference between a Goon and a Pubbie is: the Goons have a support network. Same w/the CFC vs. non-CFC: we've got a support network. We make an effort to keep that support network, but that's the bottom line. And the reason we have it is because everyone else in that network needs one, too. We all need help some time, but you can't help everyone. So you pick your battles. You help the people who're useful to you, in-game, or the people you know, whose company you enjoy (which, it can be said, is one of the ways people are useful to you - after all, what is altruism but an exercise in encouraging your own positive self-image?). IRL, you try to help everyone you can, but resources are finite. Eve is a game of 'Us vs. Them', man. The Goons just play it no-holds barred. @Arrendis: "Eve is a game of 'Us vs. Them', man. The Goons just play it no-holds barred." And I have never once told you that you should stop shooting at us, have I? I've only said that your efforts aren't actually having the effect you seem to think they will, and poked holes in your analysis of RvB's situation. Which, to be fair, is how my group tends to work it, too. So good work! Keep policing the gene pool, as it were. You, ant the top commenter, seem to miss one aspect. In WoW, the only way you can be victim to M and S, is if you purposefully let them. You can play without influencing or being impacted by them quite easily by having a closed guild. I often hear the rebuttal: "But they can get the same things as us! The greens from next expansion invalidate my work! The easiest way to progress is to just wait." To this, mr. Gevlon, I reply with one thing. What happened to Thorstein Veblen's philosophy? Since when is accomplisment validated by peer acceptance? Who the hell cares that epics are handed out to M and S? The value of enjoyment in game, at least for some people, is drawn from personal improvement. Or say, even the improvement of a closed social circle. (As in a HC raiding guild). Waiting around to be showered by epics improves nothing, advances nothing, and, at the end of the day, is devoid of any meaningful fun. Christ. Gear is not a rewards, it is a tool. The reward is something else entirely, but it seems that you and M&S are not all that different. In the end, I grew bored of WoW. Not too bad, playing 6 years. However, I got bored before the trial month was up in Eve. I do not want to play alongside idiots. I do not want to be inconvenienved by them. I do not want to influence them or win over them, or profit off them, or whatever. If you just wsnt to be left alone and find a path to self improvement that is not reliant except on a few friends, you need WoW. If you want to bump into morons all day, every day, play Eve. @Anonymous: peer opinion is irrelevant, peer competition is not. Other people are objectively existing. The problem is that you can't determine if you are actually perform personal improvement or just got gear upgrades like everyone else. Peer opinion and peer performance are intrinsically linked. The latter has no drive without some measure of desire for the former. I know for me, the 'reward' in WoW was never the purple pixels. It was the laughter and 'hell yeah!' of both me and my friends along the way to getting them. It was having fun. Gevlon, on the other hand, tends toward more concrete, measurable objectives. I'd say 'tangible', except of course that we're dealing entirely with things that don't exist. He's a-social (at least, I think that's the term he uses), by which (and this is not intended as any kind of insult) he appears to mean a specific flavor of high-functioning autistic-spectrum condition. He's actually made significant progress in his understanding of social dynamics and empathy over the last year+, but if you go back and look at some of the posts from last summer during the Fountain War, you'll see him pointedly saying that 'fun' cannot be an objective. And Gevlon, as far as no objective way to determine personal improvement: 'Did you get farther than last time?' is often enough of a measurement for many people. Except "Did you get farther than last time?" is automatic in WoW due to constant nerfs and gear upgrades. Well, sure, and that's why WoW's a crap game these days. Back in Vanilla, not so much. "Except "Did you get farther than last time?" is automatic in WoW due to constant nerfs and gear upgrades." Only if you consider killing a current tier boss is the same of going back to that boss when the next tier comes to kill it. Yes, WoW wont let you make a difference between those that killed the boss in heroic before the nerf and after the nerf, but that is just comparing yourself to others. But thats being social, not a-social. Being a-social is ignoring what people are doing for whatever they are doing and focusing solely in your objective. During my time playing WoW (from start to shortly after the first tier of bosses on Cataclysm) I only measured my progress against myself. "Did I did my rotation better this time? Did I took less damage than last time? Did I killed the adds correctly this time? Was I the cause of any wipe?". Whatever else you use as a measure could be considered as being social, suffering from peer opinion. For example, being in a top 10, 100, 1000, or casual guild can never influence your measured progress towards your objective ,unless the objective is to be in one of those guilds, wich I would argue is a social objective. Or comparing your damage done/healing done/whatever against those on the top guilds. I'm with Gevlon on WoW argument. Old difficult content in WoW do not remain intact and on the same level of difficulty. They do get progressively easier over time. And "accessibility" is a demonstrable goal of Blizzard. I'd love to work toward a goal of clearing, say, TBC raids as they were back in the day, but i can't anymore. And the goal of clearing current raids comes with a constraint of "you have to do it in a limited pre-nerf timeframe", which is not conductive to my personal experience of fun. I get that they are trying to allow people who are not very good at winning to still have fun, but this is not the case where you can have your cake (play on easy mode) and eat it (win in hard content). I see little difference between considering some people 'Morons and Slackers' and "Pubbie Shitlords'. In many ways you, Gevlon, are just like the Goons. People not seeing or doing stuff your way are M&S, or whatever derogative you favor that day. Goons scam and gank to further their own interests. You gank because "you care" and want to teach people. I actually find the goons more honest. I still like you a lot more than I like the goons, but hey, still calling it as I see it. Goons scam and gank to further their own interests. You gank because "you care" and want to teach people. I actually find the goons more honest. Well, let's be honest here, the reasons are exactly the same. The Goons scam and gank because doing so makes them feel good about themselves. Gevlon attempts to inform the 'M&S' because doing so reinforces his positive self-image - it makes him feel good about himself. It's all self-interest. All altruism, all selfless acts, boil down to exactly that: self-interest. We want to feel good about ourselves. We want to like who we are. Or we want to make sure that we live in conditions where, if we find ourselves on the low end of the totem pole, our needs are still met. Cooperation and social behaviors are all about self-interest, be it shared food supplies or screaming warnings at all the other primates that LOOK! PREDATOR! The cell is a fundamentally greedy little machine. It only limits its own consumption when doing so provides tangible benefits in the long-term. Without any thought, rhyme, or reason, that's simply how life works: long-term success is the only thing that outweighs pure individual consumption. In the short run, the amoeba might consume more than a single cell in a hydra, but over the long term, the hydra's cells have better protection against multi-cellular predation (like hydras). Human behavior's no different, it's just made more seemingly complex by aggregation and recursion - we're products of all that's gone before, be it things that have happened to us directly, or the things that influenced those who interact with us. Gevlon's motives, the Goons' motives, the motives of any serial killer or saint... they're all the same. It's just a matter of understanding how the pieces come together. In truth there is only one reason why goons do what they do: because they can.